LaVonda Evans and Dontavia, her adopted daughter. 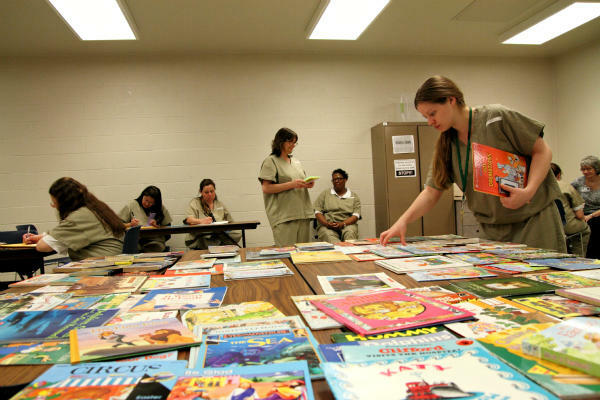 The Abendscheins have been bringing children's books to prisons in Missouri since 1998. 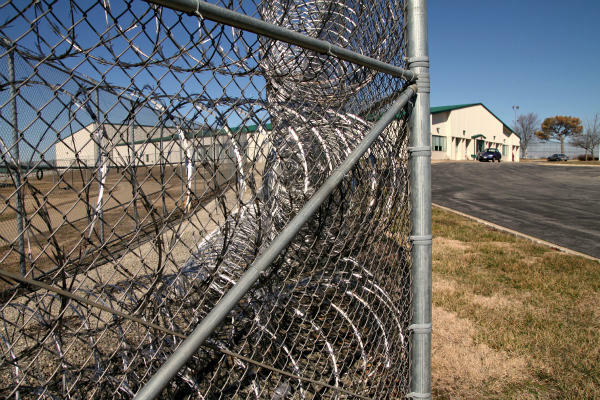 About 80 percent of the women at the Chillicothe prison have children. Suretta Collins has a four-year-old daughter. "I'm hoping she'll take me back," said Collins. Outside the St. Louis Zoo. Orangutans behind glass. "I got a little choked up, because I know how it feels to be caged up," said Barnes. "To be confined to just a little space -- it hurts." "Beautiful time, having an awesome time. What about you?" "We've collected thousands and thousands of books – we probably have ten or twenty-thousand books in a storage unit we keep in St. Louis," said Jane Abendschein. 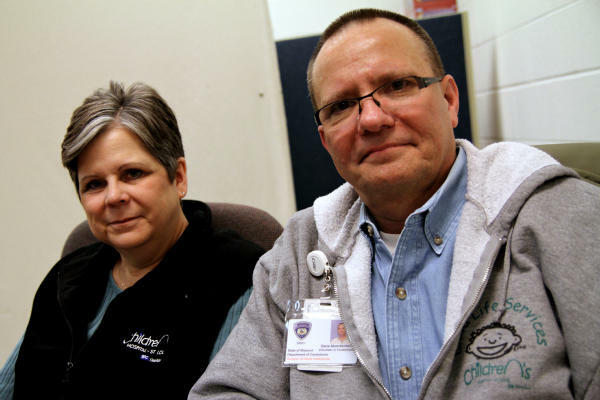 She and her husband, Dana Abendschein, started this program back in 1998, beginning at the women's prison in Vandalia, Mo. "Seeing the moms with their kids really broke our hearts because a lot of the kids and the moms didn't know each other at all," said Dana Abendschein. Their idea is that a book, and a parent's voice, can help bridge that gap of distance and barbed wire. The program is called Story Link, and these days, volunteers visit 15 state prisons in Missouri each month. 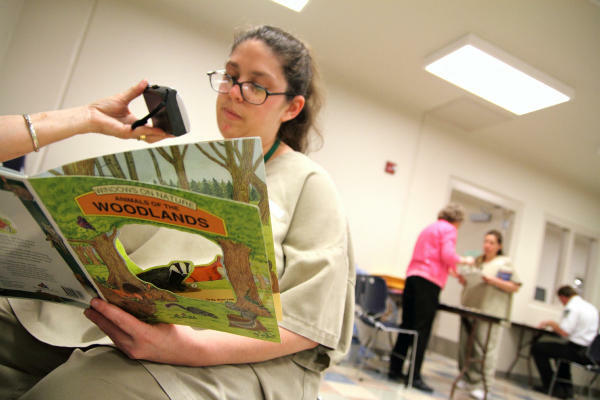 Inmates choose a book, read it to a CD or tape recorder, then volunteers mail it off across the state. Callion Barnes has been in prison for almost eight years. 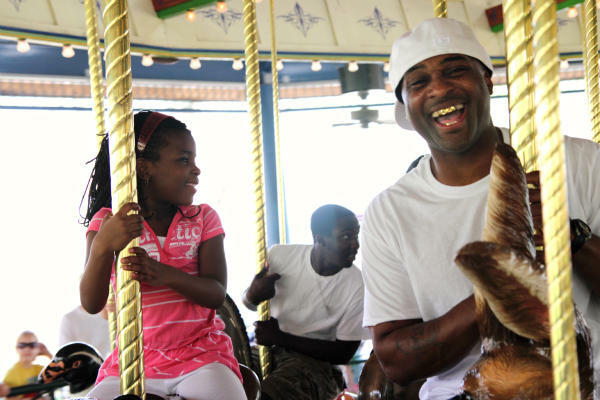 His seven-year-old daughter was born a few months after he was incarcerated. But reading books to her each month has helped build a relationship. "When you read the book, you feel like you're right there with your child. You physically – mentally, rather – visualize your child being there, as if you were talking to your child." 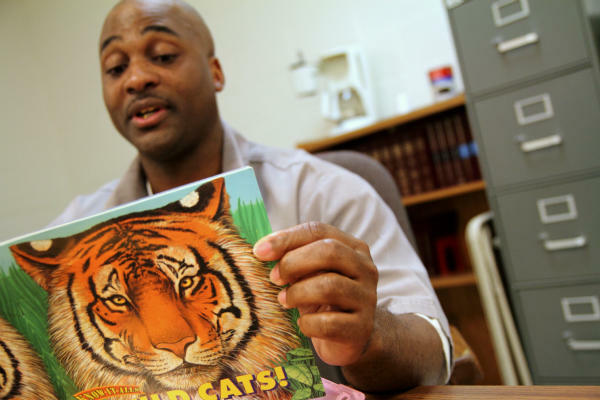 On a recent Saturday, wearing the prison grey at Tipton Correctional Center, he sorted through the donated books, looking for one his daughter Dontavia would enjoy. "She likes Dora. You know, Dora and Sponge Bob. The typical seven-year-old stuff." "Sugar, I want to let you know how much I love you and miss you. I just miss you so much and hope you go back and reread your books and reread your CDs and stuff. You have a blessed day, and Daddy loves you. Bye." A few days later and 160 miles away, in St. Louis County, Dontavia pulled the book and CD out of the envelope. 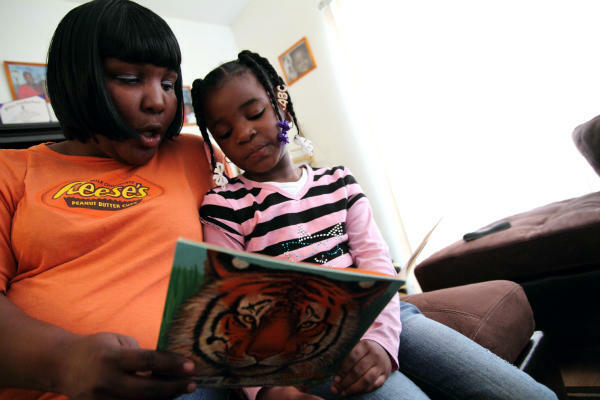 Her adoptive mom, LaVonda Evans, put the CD on while Dontavia followed along in the book. "It helps her a lot because she'll try to sound out the words and then she'll listen and listen and listen until she learns all the words from him reading it to her," said Evans. Evans has had Dontavia since she was six months old. But she didn't know where Dontavia's dad was until 2005, when by chance she met Barnes's aunt. "She gave me his name, and I just wrote the prison. And when he wrote back and we found out where he was, I took her to see him within the first two weeks." That very first visit, on the drive to the prison, Evans had to explain to Dontavia that her dad was in prison and why. "She understands it to a certain point, then to a certain point she doesn't." Barnes was convicted in 2005, after a robbery gone awry. "I was using drugs, snorting heroin, and in the course of the robbery, it went haywire." Barnes was with a friend, the friend had a gun, and the guy they were robbing ended up dead. Clark Peters, professor at the University of Missouri School of Social Work, said regardless of the crime committed, family connections endure. "Even when there are sort of disturbing violent crimes, those individuals return to the communities, and they return to their families. They become parents again." Peters said programs that help parents in prison connect with their kids can make a big difference later on. "If they've been completely absent, and there's been no maintenance of that connection that will just make for a much more troublesome reentry process." I met up with Barnes again, about a month after he sat down to read Wild Cats at the state prison in Tipton. 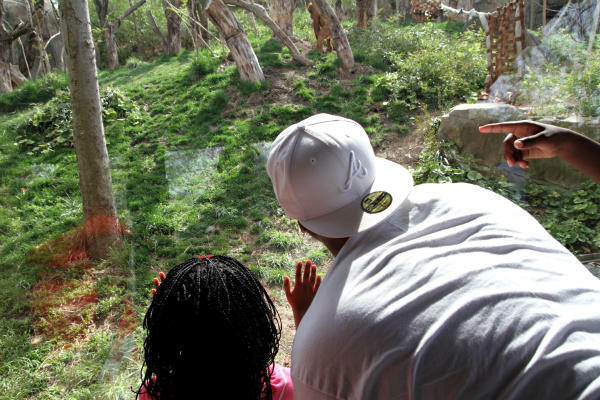 This time, we were at the St. Louis Zoo. It was a bright spring day and Barnes was wearing a blinding white t-shirt and Atlanta Braves cap, a free man. This would be the first time he'd seen his daughter Dontavia outside of prison. "Where's my hug at?" he said, scooping her up. "How you out?" she asked. "I got out to come see you." "And did they take you back?" "No! I don't have to go back." "No, I'm out, I'm free. I came to have fun with you at the zoo." It was a happy day. First the great apes, then the penguins, then a ride on the carousel. Dontavia chose a bear to ride on, Barnes an oversized rabbit or hare. "Beautiful time, having an awesome time," said Barnes, clinging to the rabbit ears. "What about you? Are you having fun?" he asked Dontavia. But Barnes wasn't blind to the challenges ahead. "I plan on taking it day-by-day, step-by-step, and slow," he said. 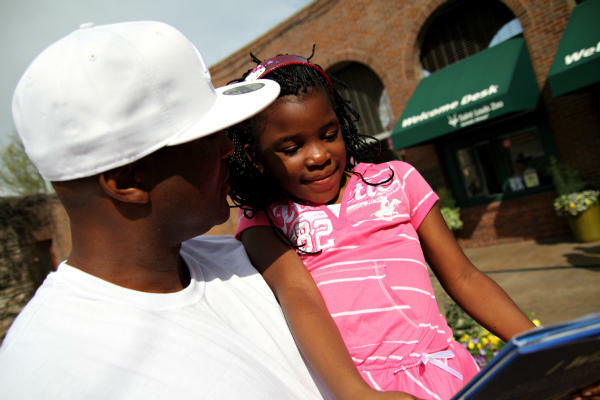 Clark Peters, at the University of Missouri, warned this can be one of the most trying moments for parents and kids, when expectations are high, but so are the real-world pressures of reintegrating into the community. "You know, if this were a movie, this is where you would cue the music, and there would be triumph, right? Well that's not when the story ends. That's when, really, the story begins. And it's a different tune within a couple of days often. It's a very difficult, difficult process."